Advantages: Knowledgeable authors, wide variety of subject matter, 1:72 and 1:48 scale general arrangement drawings, colour profiles; industry news and reviews. Conclusion: A magazine that contains a varied assortment of subject matter specifically aimed at the WWI aeroplane enthusiast. 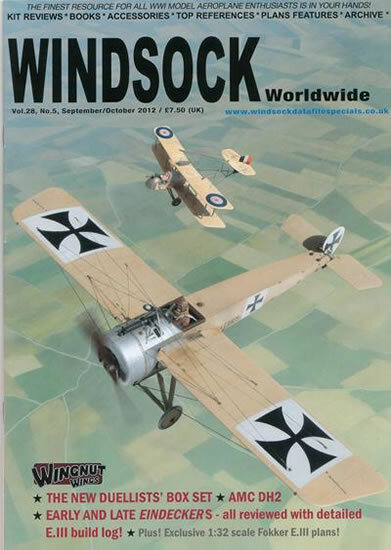 Windsock Worldwide is an A4 sized magazine that caters specifically for WWI model aeroplane enthusiasts. Inside are 32 pages crammed with a wealth of information on a broad range of topics. Lance Krieg continues his popular “Modelling Master Class” series and this time he takes a look at detailing. The author discusses how details should not be seen as afterthought, but rather an enhancement that blends into the subject as a whole. Some of the items covered are airscrews, wheels, tail skids, lacing, fasteners and vents. The skills of numerous modelers are showcased over the six pages and the informative text is backed up with a multitude of colour images. 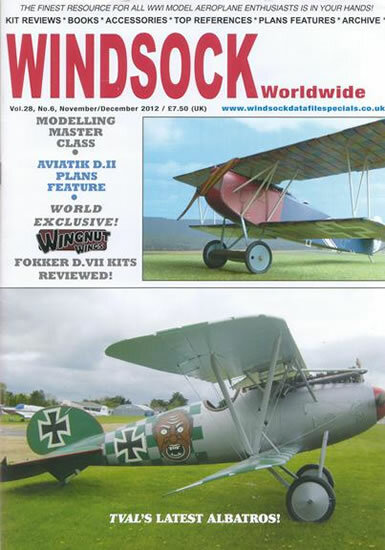 Wingnut Wings recently released their Fokker Eindecker series. Ray Rimell takes up the challenge of building the E.III and he does so using 8 pages of step-by-step diagrams. The narrative is full of useful hints and tips, and we are even supplied with a set of 1:32nd scale plans. The AMC DH2 was the other combatant in the WNW “Duelist” double release. The Editor also tackles this kit and offers sage advice on final assembly and rigging. Both aircraft get comprehensive reviews as well, along with books, journals, and other WWI related material. Lance Krieg continues where he left off in the previous issue of “Modeling Master Class”. This is the second part of his discussion on detailing. Subjects under consideration here are skis, floats, and wheels, the latter coming in for a scratch building lesson using photo-etched spokes. Windscreens, canopies, and stitching also come in for special treatment as do inspection windows and clear viewing panels. Simulating wing rib tapes and battens complete the article which contains the usual close-up images. Two pages are reserved for Richard Dawson 1:10 scale Albatros D.Va. It was scratch built using a variety of materials with construction photos plus text helping to describe the process. From the George Haddow archives comes the story of the Aviatik D.II Series 39/338. This was an experimental 1918 Austro-Hungarian fighter that sought to decrease drag by eliminating as much wire bracing as possible. Aside from some excellent period photographs, Ronny Bar supplies 3 inspirational colour profiles. There are also scale plans in both 1:48 and 1:72 scales for the intrepid scratch builder. The 5th installment of the “Great War Paint” series looks at the Nieuport 10/12 in France 1915-1917. As well as a schematic rigging diagram, there is a chart displaying the various diameters of wire used. Two pages crammed full of colour schemes give plenty of motivation for decal manufacturers. Rounding out each publication are reviews that cover kits, books, decals and accessories. This is the ideal magazine for those with any interest at all in WWI aviation. It provides articles from authors recognized in their fields and the diversity of material means that there’s something here to please everybody.